Cover crops boost Midwest corn production, even in marginal soils and dry years. Years of no-tilling helped Indiana farmer Jeremy Mills save time, fuel and money, but it wasn’t until he used annual ryegrass as a cover crop that he grew 200 bushels-per-acre corn (bu/ac.). Mills, who has a small livestock operation, farms 2400 acres in the Indianapolis suburbs with his father, Steve. He estimates that cover cropping contributes more than 20 bushels to his corn yield. His previous high yield, before cover crops, was 177 bu/ac. “I started planting annual ryegrass about eight years ago, in an attempt to break up compaction,” Mills said. “I’d gone to the National No-Till Conference and read articles about how no-till benefits are boosted with annual ryegrass. Between compaction and poor drainage, Mills said, “I used to lose up to one-third of some fields because of water ponding. That doesn’t happen anymore. Cover crops have reduced compaction, improved water infiltration and increased yields,” he said. At the no-till conference, he might have talked to Ralph “Junior” Upton, a Springerton, Illinois, farmer and Midwest pioneer with cover crops. In the mid 1980s, Upton began to realize he needed extra help to break up his hardpan soil. It wasn’t long before he understood, too, that the biggest differential that cover crops offer in corn yields comes in years when it turns dry mid-summer. This is where the impact of deep-rooting annual ryegrass allows corn roots to get below compaction to deeper moisture. “I have some hillside land where corn would fall apart real quick in dry weather,” Upton explained. 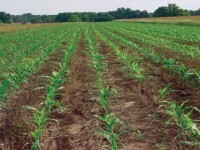 “Because of the plowpan, corn roots would grow horizontally and after 10 days of no rain, the corn would be burning up. With annual ryegrass, that same land can now go four weeks without water and still not give up much yield,” he added. “Last year, there was no rain between July 7 and September 15. With normal rainfall, I’d get 200 bu/ac. Yet, I still got 160 bu./ac. because of the cover crop,” Upton said. o Conventional till – 52.5 bu./ac. He also tried aerial seeding around Labor Day last year, into standing corn. With a warm, wet fall and early spring this year, the cover crop didn’t get killed off until the weather dried out. The annual ryegrass had, in the meantime, eliminated the potential for other winter annuals to sprout. Comparing the seeding methods, Mills said, “I think I’ll go back to using a drill to plant annual ryegrass. In some years, using the drill, I was able to get a good stand with between 12 and 15 pounds/acre. Flying it on, I took my seed dealer’s advice and applied it at 25lb./ac. and that proved to be too heavy…at least last year.” He estimates his cost for aerial seeding annual ryegrass (including seed cost) at about $25/ac. while drilling it is about the same. “I’ve seen a marked improvement in the water infiltration since I began using cover crops,” Mills added. He largely relies on annual ryegrass but has lately experimented with cover crop mixes, including winter peas and radish, both of which died off over the winter. In today’s cost-conscious environment, Mills figures that even with the cost of cover crop seed and management, he’s still ahead because of higher yields and the value of greatly improved soil health. This entry was posted in Rye Grass Cover Crop on August 7, 2011 by RyeGrassWordPress.